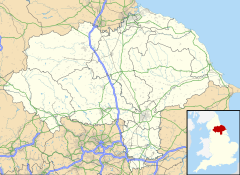 Tadcaster is a market town and civil parish in the Selby district of North Yorkshire, England, 3 miles (5 km) east of the Great North Road, 12 miles (19 km) north-east of Leeds, and 10 miles (16 km) south-west of York. The River Wharfe joins the River Ouse about 10 miles (16 km) downstream from it. Tadcaster is twinned with Saint-Chély-d'Apcher in France. The Romans built a settlement and named it Calcaria from the Latin word for lime, reflecting the importance of the area's limestone geology as a natural resource for quarrying, an industry which continues and has contributed to many notable buildings including York Minster. Calcaria was an important staging post that grew at the crossing of the River Wharfe on the road to Eboracum (York). The suffix of the Anglo-Saxon name Tadcaster is derived from the borrowed Latin word castra meaning 'fort', although the Angles and Saxons used the term for any walled Roman settlement. Tadcaster is first mentioned in the Anglo-Saxon Chronicle, where it appears as Táda, referring to the place where King Harold assembled his army and fleet before entering York and proceeding onwards to the Battle of Stamford Bridge in 1066. Two Manors. In Tatecastre, Dunstan and Turchil had eight carucates of land for geld, where four ploughs may be. Now, William de Parci has three ploughs and 19 villanes and 11 bordars having four ploughs, and two mills of ten shillings (annual value). Sixteen acres of meadow are there. The whole manors, five quaranteens in length, and five in breadth. In King Edward's time they were worth forty shillings; now one hundred shillings. The place-name means 'Tata's Roman fort'. In the 11th century William de Percy established a motte-and-bailey fortress, near the present town centre using stone reclaimed from Roman rubble. The castle was abandoned in the early-12th century, and although briefly re-fortified with cannon emplacements during the Civil War, all that remains is the castle motte. The outline of the long-demolished southern bailey still impacts the geography of surrounding streets. The original river crossing was probably a ford near the site of St Mary's Church, followed by a wooden bridge. Around 1240, the first stone bridge was constructed close by, possibly from stone reclaimed from the castle. At 11 am on Tuesday 7 December 1642 the Battle of Tadcaster, an incident during the English Civil War, took place on and around Tadcaster Bridge between Sir Thomas Fairfax's Parliamentarian forces and Sir Thomas Glemham's Royalist army. The bridge over the Wharfe was constructed on the foundations of the stone original in around 1700, although it has been substantially modified at least twice since. Historically, the bridge marks the boundary between the West Riding and the Ainsty of York. Important people would have been formally greeted here on their journey to York. A market has been held since 1270, when Henry de Percy obtained a royal charter from Henry III to hold 'a market and fair at his manor of Tadcaster', to be held each Tuesday. The ancient market place is at the junction of Kirkgate and Bridge Street. A stone base, believed to have been part of the original market cross stood on Westgate where the Tadcaster War Memorial now stands. The present-day market is held on Thursdays on the car park of Tadcaster Social Club on St Josephs Street. For local government purposes, the River Wharfe divides the town into eastern and western electoral wards. The combined population of Tadcaster East and Tadcaster West in 2004 was 7,280, 3,800 in Tadcaster East and 3,480 in Tadcaster West (source: Office for National Statistics). The local authority is Selby District Council. Tadcaster gave its name to a much larger rural district council, Tadcaster Rural District and other administrative areas. This may lead to confusion when comparing the size and extent of the current town with information for earlier periods. For example, the population in 1911 of the Tadcaster sub-district was 6831 compared with that of the Tadcaster Registration District, 32052 (source: A Vision of Britain through time). Tadcaster also elects a mayor on an annual basis. Tadcaster has a long association with the brewing industry because of the quality and accessibility of the local water supply. Rich in lime sulphate after filtering through limestone, in the right conditions freshwater springs - known locally as popple-wells - still bubbling up near St Mary's church. Tax registers from 1341 record the presence of two thriving breweries or brewhouses in the town, one paying 8d in tax and the other 4d. Today it is second in importance only to Burton-upon-Trent as an English brewing centre. Three breweries have survived to the present day, The Tower Brewery (Coors, formerly Bass), John Smith's and Samuel Smith's Old Brewery, which is the oldest brewery in Yorkshire and only remaining independent brewery in Tadcaster. A fourth brewery stood by the river on the site of the present central car park. Sam Smith's draft horses are a common sight on the streets of the town. The three breweries employ a large number of local people. Local newspapers covering Tadcaster include The Press and the Wetherby News. The major regional newspaper in the area is the Yorkshire Post. The local BBC radio station is Radio York, and commercial stations include Minster FM and Capital Yorkshire. A leisure centre on Station Road provides for a variety of sport activities, and is the base for private sports clubs and a physiotherapy clinic. Tadcaster's community swimming pool, which includes a fitness suite, opened in December 1994; run as a charity. At the end of 2007 the pool underwent repairs costing £130,000, reopening in 2008; some fundraising was through a celebrity football match, one side of which was formed from cast in television soap Emmerdale. The route of The White Rose Way, a long distance walk from Leeds to Scarborough, passes through the town. The oldest building in active use in the town is 'The Ark', built in the late-15th century, although it has been enlarged and altered many times since. Two carved heads on its front represent the heads of Noah and his wife, hence its name. The Ark has been a meeting place, a post office, an inn, a butcher's shop, a private house and a museum; it is currently the Town Council offices. In the 17th century it was known as Morley Hall, and was licensed for Presbyterian meetings. The Pilgrim Fathers met here and are reputed to have planned their voyage to America; an exact replica exists in Ohio. The eleven-arch Tadcaster railway viaduct is 1⁄4-mile (400 m) above the Wharfe bridge; it was built as part of the projected York and North Midland Railway (Leeds Extension) line from Leeds to York. Construction of the line was authorised in 1846, and much of the northern section including the viaduct had been completed when the collapse of railway investment in 1849 led to its abandonment. Between 1883 and 1959 the viaduct carried a siding that serviced a mill on the east side of the River Wharfe. The structure is a Grade II listed building owned by Tadcaster Town Council. Tadcaster Bridge dates back to around 1700. It is the main transport route connecting the town centre, which is divided by the river, and one of the town's two road crossings, the other being the A64 bypass bridge. The bridge partially collapsed on 29 December 2015, following flooding. The collapse fractured a gas main and prompted the evacuation of hundreds of residents. The bridge was then repaired and widened, and re-opened to traffic on 3 February 2017. To the south east of the town centre, towards the village of Oxton, lies Tadcaster Mere. Designated a Site of Special Scientific Interest (SSSI) in 1987, the mere is at the centre of a former lake basin that extended over an area of about 740 acres (3 km2). It was formed during the most recent or Devensian ice age – which ended 10,000 years ago, when Tadcaster was at the southernmost limit of glaciation – by the long, low embankment of debris known as the Escrick Moraine, which is composed of debris left behind by the Vale of York Glacier. The mere is a site of current palaeontological interest, as it is believed to be the site of the earliest discovery of the plesiosaur – while unproven, the skeletal fragments found in Tadcaster match the age of those found elsewhere. St Mary's Church was built around 1150. A makeshift wooden building existed before the current church. It was destroyed by the Scots in one of many incursions before the Battle of Bannockburn in 1318. St Mary's was rebuilt between about 1380 and 1480; the rebuilding took several years. The church suffered terribly with floods, and a decision was made to carefully knock it down and construct it again in exactly the same format. This was done between 1875 and 1877 with its foundations raised by 5 feet (1.5 m); only the tower was left untouched. Money for its renovation – £8,426 4s 6½d – was raised by public subscription. In 1897 a new north aisle was added. Tadcaster used to have a railway station on the Church Fenton to Harrogate line, but this closed to passengers in January 1964. The nearest railway stations are in Ulleskelf and Church Fenton. York railway station has a wider range of services and is connected to Tadcaster by the Yorkshire Coastliner bus service. On 29 December 2015 the Wharfe bridge partially collapsed. It had been closed to traffic and pedestrians three days earlier as a result of flooding which affected much of Yorkshire over the Christmas period. Tadcaster has three primary schools (serving ages 5–11) and a secondary school (ages 11–18). In the summer 1999 league tables, Tadcaster Grammar School students obtained the best A Level results in the country for a state comprehensive school. The adult education centre is located in the Grammar School. Tadcaster has two main football teams, Tadcaster Albion and Tadcaster Magnets, Tadcaster Rugby Football Club, Tadcaster Harriers running club and Cyclesense Cycling Club. Tadcaster Tornadoes Basketball Team play in the Leeds Basketball League (Men's). Tadcaster has a swimming team for young people up to the age of 18. (Tadcaster Swim Squad). ^ UK Census (2011). "Local Area Report – Tadcaster Parish (1170217437)". Nomis. Office for National Statistics. Retrieved 21 March 2018. ^ "Genuki: TADCASTER: Geographical and Historical information from the year 1834., Yorkshire (West Riding)". www.genuki.org.uk. Retrieved 6 November 2018. ^ Ekwall, Eilert (1960). The concise Oxford dictionary of English place-names (4 ed.). Oxford: Oxford University Press. p. 458. ISBN 0-19-869103-3. ^ "Town Mayor - Tadcaster Town Council". www.tadcastertowncouncil.gov.uk. Retrieved 2019-03-06. ^ Historic England. "DISUSED RAILWAY VIADUCT OVER RIVER WHARFE (TO NORTH OF TOWN) (1167141)". National Heritage List for England. Retrieved 10 July 2014. ^ "Historic Tadcaster". Tadcaster Town Council. Retrieved 29 December 2015. ^ a b "Moment Tadcaster bridge collapsed". BBC News. 29 December 2015. Retrieved 9 April 2018. ^ Quinn, Ben (29 December 2015). "Soldiers evacuate homes after Tadcaster bridge collapses". The Guardian. Retrieved 9 April 2018. ^ Anker, Malcolm (1987). Guided Tour and Short History of Saint Mary's Church Tadcaster. Reprinted with corrections 2016: Available from the church. ^ "Disused Stations:Tadcaster Station". www.disused-stations.org.uk. Retrieved 8 November 2018. ^ "Tadcaster Swim Squad – Every race is an opportunity to measure yourself against your own potential". www.tadcasterswimsquad.org. Retrieved 9 April 2018. 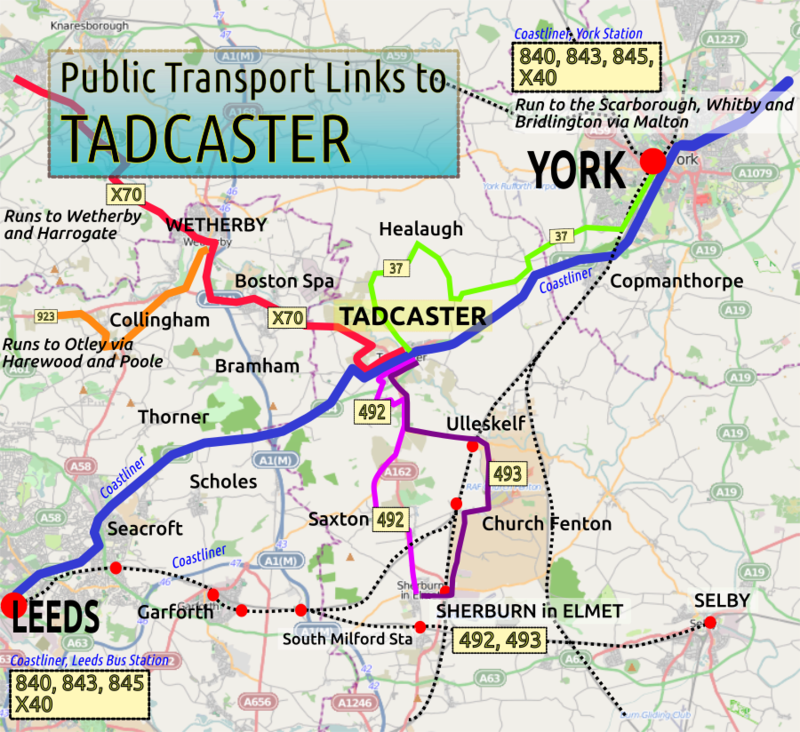 Wikimedia Commons has media related to Tadcaster. Wikivoyage has a travel guide for Tadcaster. The ancient parish of Tadcaster: historical and genealogical information at GENUKI. Considered as part of the West Riding: the ancient parish was partly in the Ainsty and partly in the West Riding.